Description: The design inspiration for this stunning piece is from the triptych style of painting, which is divided into three separate sections. 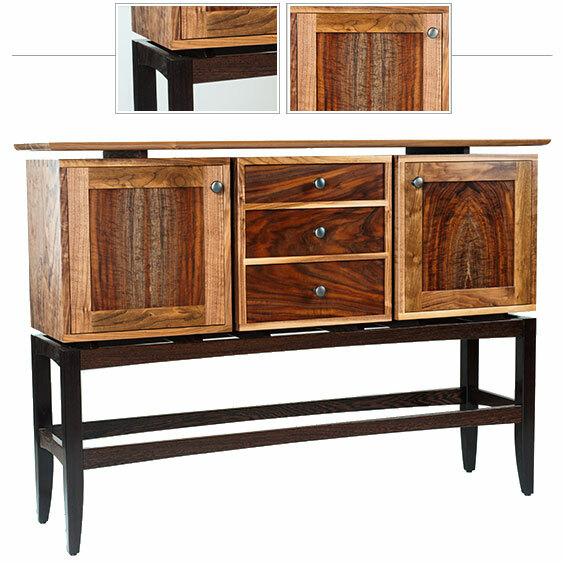 Each cabinet appears to be floating on the beautiful wenge base. The spectacular door panels are made from book-matched reclaimed claro walnut, a walnut-producing tree found a second life in spectacular lumber. The drawer fronts are made from the same reclaimed claro walnut slab. The craftsmanship is exceptional with beautiful and sturdy joinery, custom fitted drawers and doors, adjustable shelves in each side cabinet and a satin smooth finish. This is a perfect piece for a dining room as a buffet or a unique art piece in a hall or den.